Burned out from working at a medical supply company, Frank Grotti wanted a career that combined working with people, critical thinking and using the latest technology. He found all of that and more studying respiratory therapy at Tidewater Community College. Jobs are plentiful in a market where associate degree graduates earn a median of $62,581, according to U.S. Department of Labor statistics. 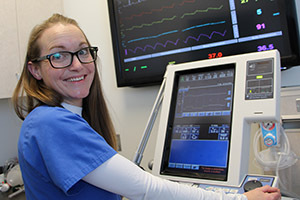 Each of TCC’s spring 2016 graduates who earned an Associate of Applied Science in Respiratory Therapy found employment with most receiving offers prior to completion of the six-semester, 67-credit program. The application deadline for the next cohort of students has been extended to Feb. 15. TCC is among eight programs in the state and the only one to offer an associate degree in Hampton Roads. Last summer the program earned the Registered Respiratory Therapy Distinguished Credentialing Success Award for the third consecutive year. It is the lone program in Virginia to hold that distinction. During its recent reaccreditation site review at the Virginia Beach Campus, the governing body found no deficiencies and accredited the program for an additional 10 years. Pass rates have been 100 percent the last two years for TCC graduates attempting the Registered Respiratory Therapy exam, which far exceeds the national average. The advent of waveform technology, which allows respiratory therapists to see the effect of applied therapies, is among the recent advances in the field. 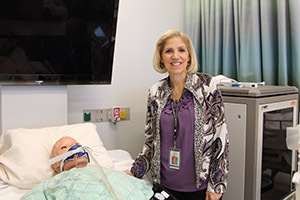 Classrooms in the Regional Health Professions Center feature high-fidelity simulators that allow faculty to change the gas composition in a “patient’s” body while the students in the lab assess the changes and make decisions regarding care. Debriefing sessions follow lab, so students receive immediate feedback about their decision-making. The program has a summer start and places students in a clinical setting by their second semester. Bieszczad has excellent professional relationships with all the major health care systems in Hampton Roads, where students attended coordinated practice. Hospital department heads are an integral part of the program’s advisory committee, meaning practicing professionals guide and steer the curriculum. Still a practicing therapist at Sentara Norfolk General, Bieszczad dispels the myth that respiratory therapists only deal with patients suffering from diseases such as asthma, COPD and cystic fibrosis. Respiratory therapists are an integral part of every medical response team, she stressed. Any patient short of breath is in need of a respiratory therapist. It’s an ideal field for retired Navy corpsmen. Prospective students who perform well in English composition and the anatomy and physiology prerequisite typically find success in the program given its emphasis on technical reading and comprehension. Paige Thomas enrolled in the program to ensure she was prepared to care for her toddler who suffers from a respiratory illness. She most recently completed her clinical rotation at Children’s Hospital of the King’s Daughters. For more information on applying for the program, contact Bieszczad at dbieszczad@tcc.edu or 757-822-7412.